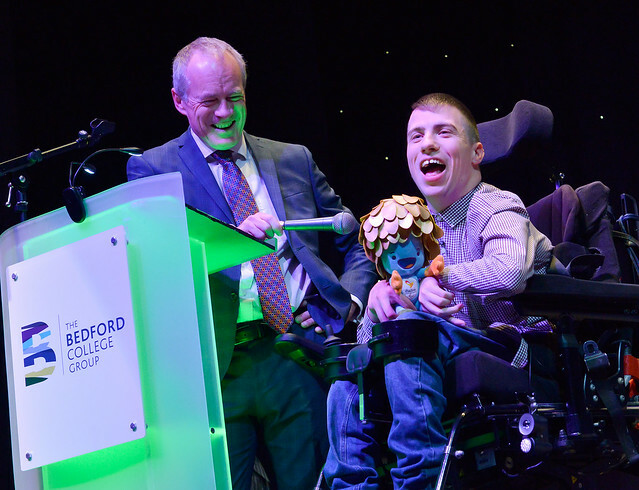 Star students took to the stage in the annual Bedfordshire Achievement Ceremony hosted by The Bedford College Group. A cast from Performing Arts wowed the audience with a set of the song This is Me before guest speaker, international author Ruth Hogan stepped up in style. 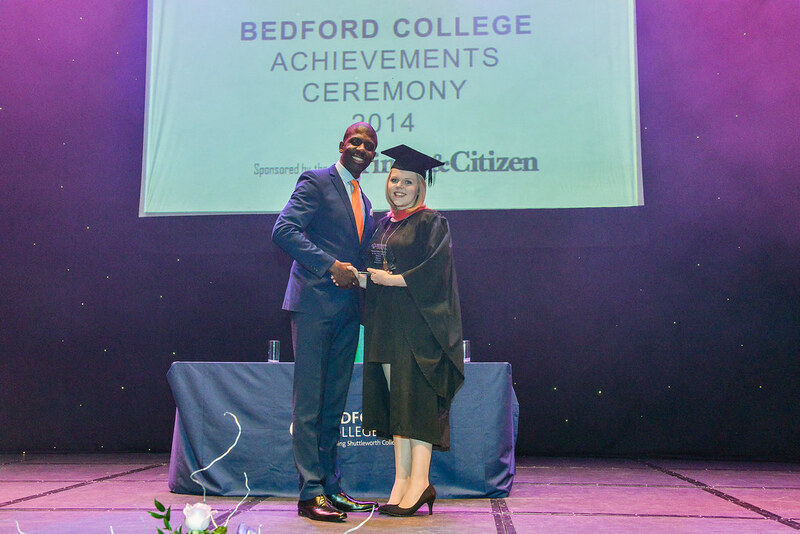 The annual Achievement Ceremony of Bedford College in 2017 celebrated the highlights of the most successful year in the 125 year history of the organisation. Bedford College can trace its roots back to the foundation of a PE teacher training college in the 1800s, through post-War changes in the 1950s and to its current status as one of the top FE colleges in the UK. The link back to the earliest days of PE teaching and sport was well made by having medal-winning Boccia paralympian David Smith as the guest speaker. David’s coach is Tresham College staff member Sarah Nolan and so it was a great link to demonstrate the added value to Bedford of the merger with Northamptonshire. 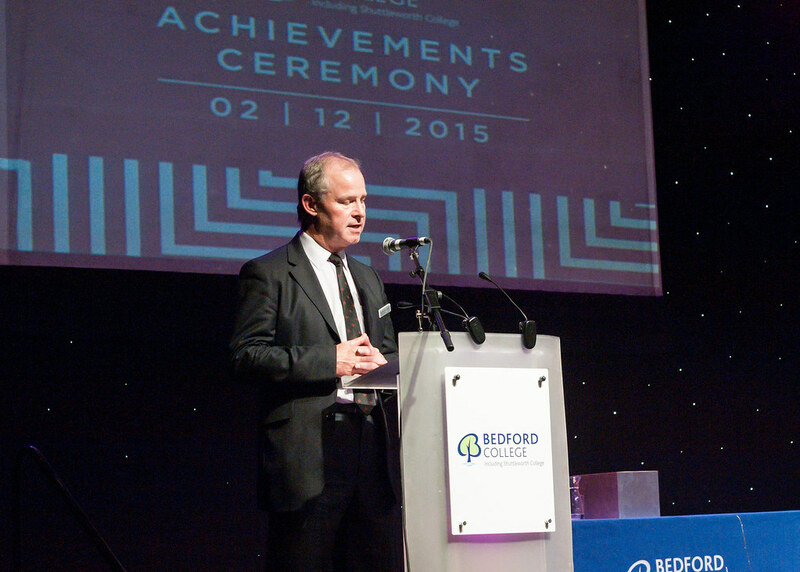 The annual Bedford College Achievements Ceremony was a glittering occasion. As the town’s Christmas fireworks lit up the skies outside, star students shone inside the Bedford Corn Exchange. Guest speaker for the evening was young entrepreneur Zak Resinato. After training at Bedford College, Zak has gone on to national success with deals with Sainsbury’s and retail parks opening 13 Jagged Edge barber pods and shops. 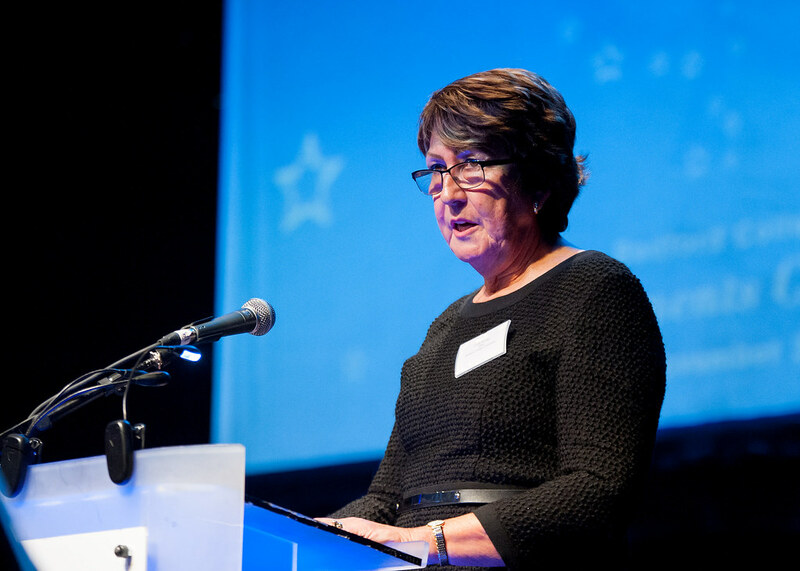 His combination of creative talent and business vision has been supported by Bedford College, which has entered into a unique academy arrangement for training 50 Jagged Edge staff. He joined Ian Pryce in presenting certificates to the three finalists in the Outstanding Student of the Year Award. The winner was Emma Lemon, a BTEC Higher National Diploma student in Art & Design, and runners-up were Oskar Kutyla, BTEC Level 3 Diploma in Engineering and Mia Tomlinson, Foundation Degree in Child & Family Studies. Star speaker at the 2015 Achievement Ceremony was the energetic Kamal Hyman selected as National Entrepreneur of the Year 2015 by TV tycoon Peter Jones CBE. He urged young people to “Aim A Little Higher”. Student of the Year Award went to Euan J Davies who, after achieving his BTEC Level 3 Extended Diploma in Production Arts, has won a place at the world-famous RADA in London. Runners-up were Katherine Barnard who has secured her dream job instructing at Grafham Water after studying at Shuttleworth College and Henna Begum who meets celebrities on a daily basis at Signature Aviation after completing her BTEC Level 3 Diploma in Travel & Tourism. 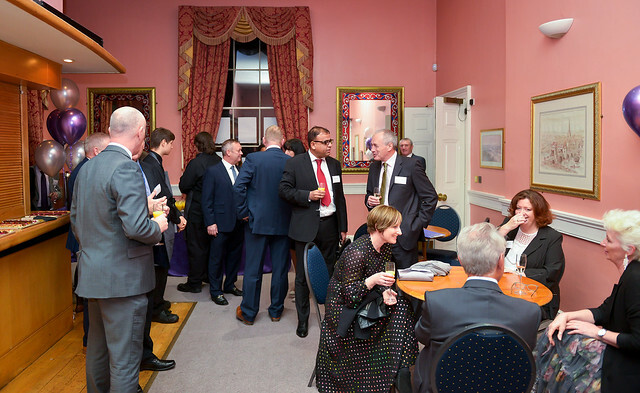 The 2014 annual Achievements Ceremony was supported by guest speaker TV presenter and businessman David McQueen. He had the audience following his entertaining hand signals to demonstrate how actions speak louder than words. Students from across the educational spectrum stepped up to receive their awards with Tiffany Trethowan winning the Outstanding Student of the Year. Earlier in 2014 Tiffany won a prestigious YCN National Design Award, with fellow student Hannah Hughes, for their joint advertising campaign for Standard Life. Outstanding Student runners-up were Joe Sheen who gained a distinction in Electrical & Electronic Engineering and Samantha Key who gained the second highest grade profile from more than 1,000 students in a Foundation Degree in Child & Family Studies.